“Why, then, do reef corals grow into such plant-like shapes? Because, although the polyps are not themselves plants, they have plants within them. The cells in the inner layers of the polyp’s tissues contain tiny cells of an alga, complete with their grains of photosynthesising chlorophyll. And the polyp looks after its captives very well indeed, building its stony cup in a shape that ensures that they can get all the light they need. 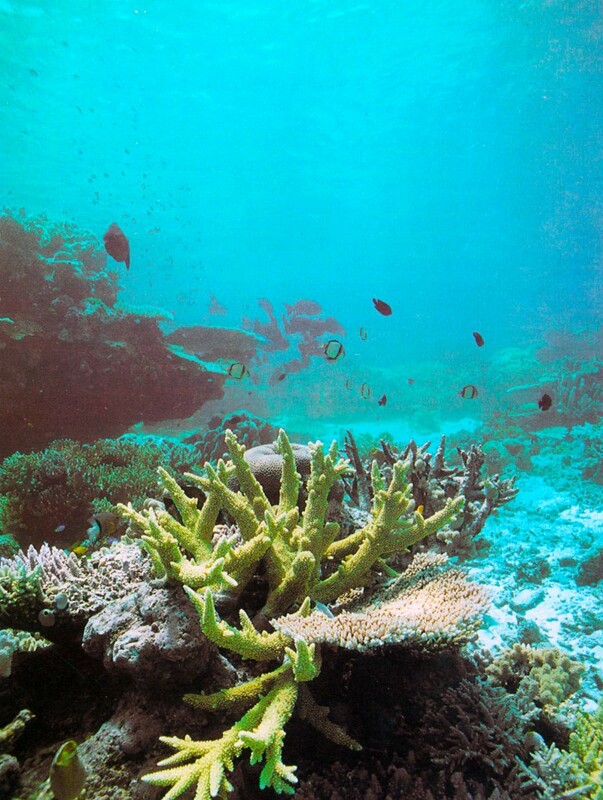 Algae very similar to those in the corals float free in the open ocean. But very few can live in the seas around coral reefs for these waters, though rich in dissolved oxygen, are very poor in nutrients. Algae, like any other plants, need nitrates and phosphates, and that is exactly what the coral polyps, like any other animal, excrete in their waste-products. So those algae that are tucked away in the polyp’s tissues, are provided with all the raw materials they need in order to flourish, yet are safe from the raids of hungry vegetarian grazers.